Regardless of who you are, at some point the thought of “What if I had superpowers?” has probably permeated your brain. The movie Chronicle gives us a chance as an audience to witnesses this discovery and subsequent aftermath. It starts as most “superhero” films do, and that is in high school. Andrew Detmer is your average, introverted, loner teen who is consistently bullied and really has no friends. In addition to your average teen struggles at school, his mother is gravely ill, and his father is a heavy alcoholic who inflicts physical violence upon him from time to time. In response to all of this, Andrew has begun to chronicle his life on camera, as it serves as a barrier somewhat between him and the outside world. His only real contact he has is his wiser-than-he-believes cousin, Matt Garetty. Matt does his best to get Andrew to open up more and have some fun, and mentions a rave later that night. Despite being resistant, Andrew attends with Matt. A short time there, Matt and his ever-popular classmate, Steve Montgomery, stumble across a peculiar hole that releases strange sounds. Needing to get this on camera, they find Andrew and the three delve deeper into the cavity, and come across a large radiant crystalline object. It looks like bad news but the group is too close now not to be affected by its effects, which include intense pain and nosebleeds. The camera cuts and loops and fades to black. Presumably weeks later (seconds in the film) we see all three teens now back on camera, playing around with the addition of telekinetic powers. Things seem all well and good, but is this new-found power in the wrong hands? 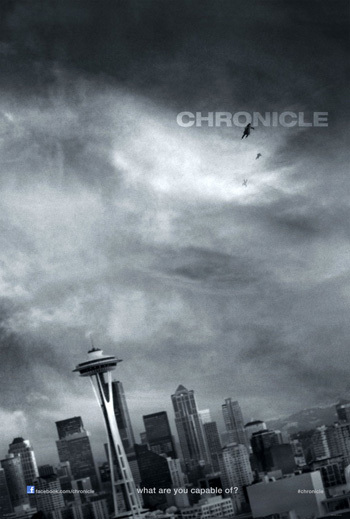 Chronicle is truly a different spin on this superhero genre. I hesitate to call it a superhero film because the three main characters are in no way, shape, or form superheroes. They are not particularly heroic, or come from a hero’s mold. There is no huge introspective moment that makes them question “Why us?” They are just random teens who happened to encounter something out of this world and now possess amazing abilities. What I have said may sound like a negative, but it could be further from the truth. I found this unique and different, and truth be told it felt “realistic.” If I was bestowed with the same abilities, I would not go and rush out to fight crime or anything; I would probably play a few pranks just as these characters did and generally keep a low profile. Of course, there would be times where I would help a person in need, but I would do my best to remain the same guy. As mentioned, the main character in this film uses a camera to capture everything in his life. If you have not figured it out by now, much of Chronicle is shot in the “found footage” style, similar to Cloverfield, The Blair Witch Project, etc. This is sort of misleading though, as we are not watching something that has been found. Rather, we are watching it as it occurs. Still, the amateur angles and shaky camera accustomed to this genre is present, mainly in the first third. As the characters start to harness and strengthen their respective powers, the camera work becomes a lot more stylistic, smooth, and traditional, with over-the-shoulder shots and wide-shots to name a few. It is a nice little touch that makes sense. While I found the filming solid, those who are averse to this technique may want to stay away. However, the ending suffers from a cinematography standpoint. It is shot from multiple perspectives, and makes what should be a climatic ending fall into anticlimactic territory. If you ever hear me complaining about a movie’s length, nine times out of 10 it is because it is too long. With Chronicle, this is the one out of ten example. At a brisk 84 minutes, this film really could have used an additional 15-25 tacked on. Surprisingly, the character development is not totally compromised with the movie’s length, which is critical with movies like this, but could have been even more fleshed out with more run time. What is compromised is why certain characters get to certain places within the story. When one character finally turns, it feels rushed, especially when the turning point itself seemed laughable. Compared to everything else, why did he turn there? Just minutes ago the character in question was having a great time and things seemed to finally be coming together. There were some slight allusions that pointed to this “heel” turn (wrestling term), but upon my first viewing a year back, it seemed random to execute it there, and it still seems out of place now. Ultimately, it is just part of the flawed last third of the film. While I did praise the film for serving up a unique take on the subject matter, there is a period in the film that feels like America’s Funniest Home Videos. This would be OK if it lasted for five or so minutes, but it goes on for 10 or 15. Some of that time could have went to more story and/or character development. The acting from two of the three leads is a joy to watch. Dane DeHaan plays the teenage angst-filled role of Andrew perfectly, and it is easy to see why he could be a very intriguing man in Hollywood for years to come. He may never be a true leading man but can serve as the foil with ease. Michael B Jordan has already achieved widespread acclaim for his role in Fruitvale Station, and as Steve he has a lot of charisma, screen presence, and general likability which should serve him well in the future. As Matt, Alex Russell isn’t terrible but not as interesting either. I enjoyed him, but he definitely paled in comparison to the other two. In a smaller role, the actor portraying the alcoholic father definitely did his job well. He came off as extremely unlikable and easy to hate in his limited screen time. Aside from these characters, no one else stands out due to the focus on the three main characters. 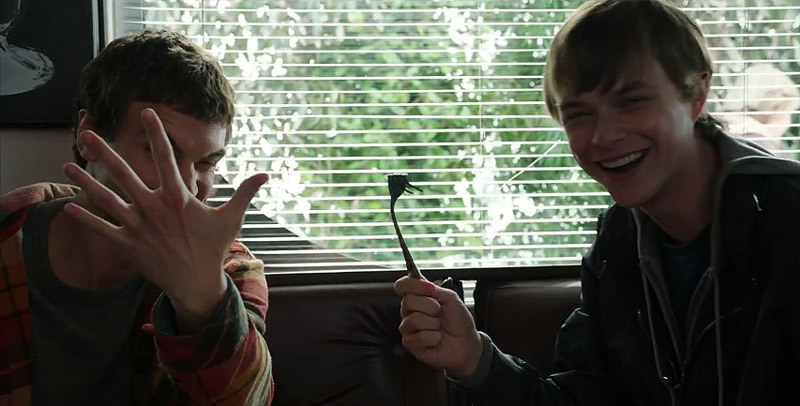 I say Chronicle deserves a watch despite the flaws. If you are open to a unique take on the genre and can stomach the nontraditional filming, you should enjoy this by and large. I agree with almost everything you said. It needs to be longer. Jordan and DeHaan are awesome. And so forth. But I would give this a higher grade (probably a B, maybe a B+). It was one of my ten favorite movies from 2012. I was maybe a little critical with the grade. A B could easily have worked. I think I just really disliked the ending more than others, or rather the execution of it. I do not mind your grade. Did not really fall in love with this film either, despite thinking the concept and acting was top grade. Maybe I was tired, or maybe I was turned off by how rushed some of the things were, as you mentioned yourself, but it just wasn’t something that I would rave about.